Originally published in 1967, The Complete Official 948 cc & 1098 cc Austin-Healey Sprite / MG Midget: 1961-1966 was prepared in close cooperation with British Leyland Motors in order to provide complete, authentic maintenance and repair information. The Driver's Handbook at the beginning of this manual is similar to the handbook that was provided with every new 948 cc and 1098 cc Sprite and Midget. The Workshop Manual, making up the larger part of this book, is the official factory manual and was originally intended for use by dealer service departments. The publisher has incorporated additional factory procedures and specifications that have become available following the publication of the original factory information. 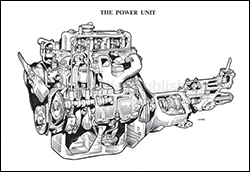 This manual contains a Special Tuning Manual that applies specifically to 948 cc and 1098 cc Sprite and Midget vehicles manufactured for the United Kingdom and North American markets, and an illustrated catalog of special tools. 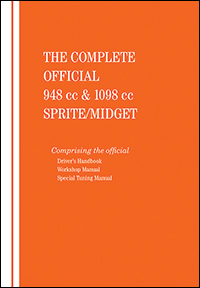 Including accurate and comprehensive service information for 948 cc and 1098 cc Sprite and Midget vehicles, this manual is an indispensable resource for both the professional mechanic and the 948 cc and 1098 cc Sprite and Midget enthusiast. This manual is an accurate and comprehensive set of service information for 948 cc & 1098 cc Sprite and Midget models sold in the UK and North America. The power unit, page 44. 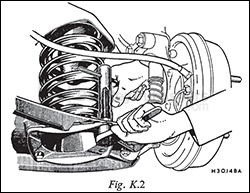 Using a pair of bolts to remove or replace a coil spring, page 151. The MG Midget (Mark II), page 2. 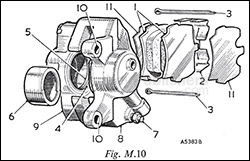 The front brake caliper components, page 172.